Does the intricate design of the universe serve as evidence for the existence of God? Imagine walking in the desert and coming across two small stones in close proximity to each other. Most probably, you would think nothing of it. Two stones randomly sitting beside each other is no big deal. You continue your walk in the desert and stumble upon three rows of stones piled up in a brick-layer fashion. Chances are you would quickly surmise that someone was here and arranged these stones in this manner. It didn’t just happen. You continue your walk and happen to find a watch lying in the middle of the desert. Would you suspect that a windstorm somehow threw these pieces together and randomly created a watch? Somebody made that watch. It didn’t just happen. Design implies designer. DID THE UNIVERSE HAVE A DESIGNER? The intricacy of design in our world is staggering — infinitely more complex than a simple brick wall or a watch. Dr. Michael Denton, in his book “Evolution: A Theory in Crisis” describes the intricate organization of nerve cells in the brain [pp. 330 – 331]. There are 10 billion nerve cells in the brain. Each of the 10 billion cells sprouts between 10,000 to 100,000 fibers to contact other nerve cells in the brain, creating approximately 1,000 million million connections, or, 10 to the 15th power. There are 10 billion nerve cells in the brain with approximately 1,000 million million connections. It is hard to imagine the multitude that 1015 represents. Take half of the United States, which is 1 million square miles, and imagine it being covered by forest, with 10,000 trees per square mile. On each of the 10,000 trees, which are on each of the one million square miles, there are 100,000 leaves. That’s how many connections are crammed inside your brain. And they’re not just haphazardly thrown together. They form an incredibly intricate network system that has no parallel in the industrial world. Imagine walking by that in the desert! The natural response when perceiving design of such mind-boggling complexity is to conclude that there must be a designer behind everything who created it. None of this just happened. Do you not realize that if ink were poured out accidentally on a blank sheet of paper, it would be impossible that proper writing should result, legible lines that are written with a pen? Imagine a person bringing a sheet of handwriting that could only have been composed with a pen. He claims that ink spilled on the paper and these written characters had accidentally emerged. We would charge him to his face with falsehood, for we could feel certain that this result could not have happened without an intelligent person’s purpose. The argument is too simple. There seems to be a big jump from concluding that someone must have made rock formations in the desert to concluding that there is a Creator who must have made the universe. What about evolution? Over a very long period of time everything could have come about as a random occurrence! With millions of years to play around with, isn’t it possible for some kind of order to emerge just by chance? Let’s address these two objections. The principle “design implies designer” applies across the board, whether the designer is a Bedouin nomad piling rocks in the desert or the Infinite Source of all existence. Intellectually it is the same logical process. In fact, there is more reason to assume a designer in the latter case since the level of design is much higher. Simplicity is not an inherent fault in an argument. Perhaps the reason why some people take issue with this application of logic is due to the accompanying consequences. The reason why some people take issue with this logic is due to the consequences. When the interference of cognitive dissonance is removed, what is the objective standard of design that we need to see in order to conclude something was created? What we need is a control experiment that determines this threshold of design in a case that has no threatening consequences. 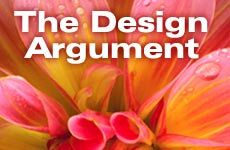 “The Obvious Proof”, a book by Gershon Robinson and Mordechai Steinman, delivers a compelling presentation of the design argument, and describes such a control experiment involving millions of people concluding the necessity of a designer. The laboratory consisted of theaters across the globe that showed the film “2001: A Space Odyssey.” In the film, American scientists living in a colony on the moon discover during a dig the first evidence that intelligent life exists on other planets. What did they find? A simple monolith — a smooth, rectangular slab of rock. The Americans keep this significant discovery secret, afraid of the widespread culture shock and social ramifications this would have without proper preparation. Thousands of film critics and millions of moviegoers went along with the film’s basic assertion, agreeing that intelligent creatures other than man must have created this smooth, rectangular monolith. It didn’t just randomly appear. Free from all emotional and intellectual bias, in the comfort of darkened theaters with popcorn in hand, people unanimously agreed that a simple, smooth slab with a few right angles was conclusive proof of intelligence. When the conclusion does not point to God, everyone realizes that the simplest object can serve as the threshold of design, the point at which one concludes an object could not have come into existence by random accident. The universe, infinitely more complex than a monolith, had to have been created. Given enough tries over a long period of time, isn’t it possible for complex structures to emerge randomly? After all, with sufficient trials even improbable events eventually become likely. Robert Shapiro, a professor of chemistry at New York University, uses a national lottery to illustrate this point [“Origins”, Bantam, p.121]. The odds of winning the lottery may be 10 million to one. Winning would be incredibly lucky. But if we were to buy a lottery ticket every day for the next thirty thousand years, a win would become probable, (albeit very expensive). But what are the odds of life coming about by sheer chance? Let’s take a look at two examples to get a sense of the odds involved in random evolution. It is a bit like the well-known horde of monkeys hammering away on typewriters — most of what they write will be garbage, but very occasionally by pure chance they will type out one of Shakespeare’s sonnets. Similarly, in the case of the universe, could it be that we are living in a region that just happens by chance to be smooth and uniform? There are 488 letters in the sonnet … The chance of randomly typing the 488 letters to produce this one sonnet is one in 26 to the 488th power, or one in 10 to the 690th power. The number 10690 is a one followed by 690 zero’s! The immense scale of this number is hinted at when one considers that since the Big Bang, 15 billion years ago, there have been only 10 to the 18th power number of seconds, which have ticked away. To write by random one of Shakespeare’s sonnets would take all the monkeys, plus every other animal on earth, typing away on typewriters made from all the iron in the universe, over a period of time that exceeds all time since the Big Bang, and still the probability of a sonnet appearing would be vanishingly small. At one random try per second, with even a simple sentence having only 16 letters, it would take 2 million billion years (the universe has existed for about 15 billion years) to exhaust all possible combinations. Robert Shapiro cites Nobel laureate Sir Fred Hoyle’s calculation of the odds of a bacterium spontaneously generating [p.127]. At first Hoyle and his colleague, N. C. Wickramasinghe, endorsed spontaneous generation, but reversed their position once they calculated the odds. What’s the chance of a tornado sweeping through a junk-yard and assembling a Boeing 747? These are the odds of just a single, simple cell, without which evolution cannot even get started. Never mind the odds of more advanced compounds like an organ or all the enzymes in a human being. The improbability involved in generating even one bacterium is so large that it reduces all considerations of time and space to nothingness. Given such odds, the time until the black holes evaporate and the space to the ends of the universe would make no difference at all. If we were to wait, we would truly be waiting for a miracle. For all intents and purposes, an event with the probability of 1 in 1040,000 qualifies in real-world terms as impossible. Imagine you are the presiding judge over a murder trial. Ballistic tests match perfectly with a gun found in the possession of the accused. The odds of another gun firing the bullet that killed the victim are let’s say one in a billion. The defendant’s fingerprints are found all over the victim’s body. He claims there must be another person out there who happens to have astonishingly similar fingerprints. Again, it is possible. There are also eyewitnesses who testify to seeing a man gunning down the victim who looks just like the defendant. The defendant claims there must be another person out there in this big world who looks just like him, and that man is the real murderer. After all — it’s not impossible. You are the judge, and you need to make a decision. What do you decide? In the pragmatic world of decision-making, odds this high are called impossible. One needs to weigh the evidence and come to the most reasonable conclusion. Does the universe have a Creator? Look at the design, look at the odds and look honestly within. Where does the more rational conclusion lie? This entry was posted in Articles, WHAT is kiruv? I am orthodox, interested in kiruv. The creator argument is very compelling, but I am afraid of the following retort, which I cannot answer. If all highly organized things need a designer or creator, how does Hashem exist? Does He have a creator, or can things simply come into being with out one?